The range of the black crake is Sub-Saharan Africa. Black crakes inhabit freshwater marshy areas and swamps, needing water and vegetation for cover. Black crakes incubate their eggs for 13-19 days. 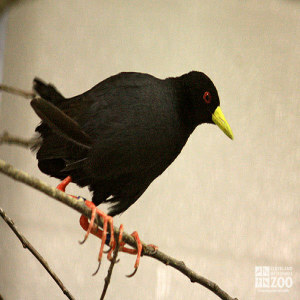 The black crake has movements that are typically rail-like. The carriage is upright with the head bobbing and the short tail flirting constantly as the bird walks. It walks on floating vegetation in the manner of lily trotters and jacanas. It emerges from cover to secure food from the water surface, leaves of aquatic plants, and from mud. It frequently perches on hippos and warthogs and gleans their ectoparasites. It is a good swimmer and dives to avoid danger in the water or, if found on land, will fly to a high bush or dive for cover into reeds or tall grass. It can also "freeze" in defense. The nest of the black crake is built as a deep cup made of reeds, rushes, sedges or grasses. It is located in vegetation just at or above water level. In some portions of the range where flooding is frequent, the nest is built high above the water level. Both parents incubate the eggs and care for the young. There are frequently 2 broods a year. The first brood stays with the parents for 6 weeks after hatching, and the second stays 8 weeks.